This coin was minted during the 12th and 13th centuries under the authority of the Bishop of Maguelonne, a region in the south of France. The obverse shows an interesting cross constructed of a fasces (a bundle of rods tied together) crossed by two mitres (the unusual ecclesiastical or "pope type" hat). The fasces is a symbol of Rome, the mitres symbolize the ecclesiastical authority of the bishop, whose ultimate authority resides in Rome. The lettering of the legends on this coin are among the most interesting I have seen. 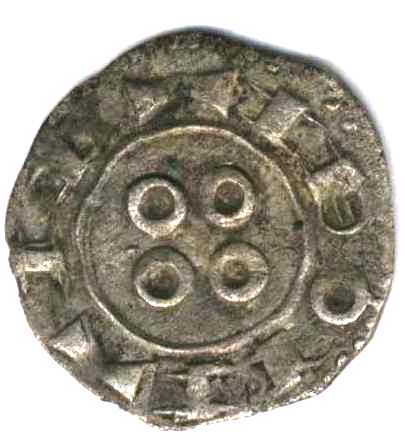 The obverse legend reads RAMUNDS after Raymond, the first bishop which issued these coins. The three large bars at 3 o'clock are the "M", the "o" at 8 o'clock is the "D". The other letters match up accordingly. On the reverse, the legend reads NAIbONA (Narbonne) which is the city in the region of Maguelonne in which this coin was minted. It surrounds four circles of unknown meaning. This was the region that was affected by the Albigensian Crusade in the early 13th century. This was a crusade to wipe out religious heresy that had sprung up in the south of France. 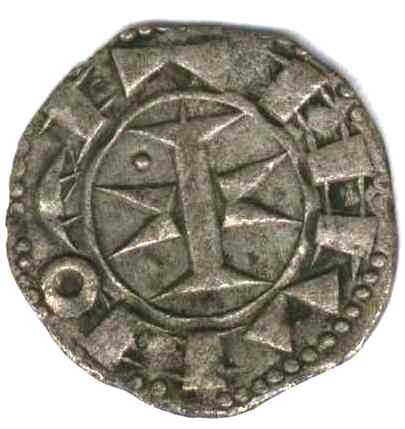 This style of coinage was discontinued in 1215 as a direct result of this Crusade. Its unique style makes this one another one of my favorites.